Want to submit your feedback to Advance Auto Parts and get a chance to win some prizes? 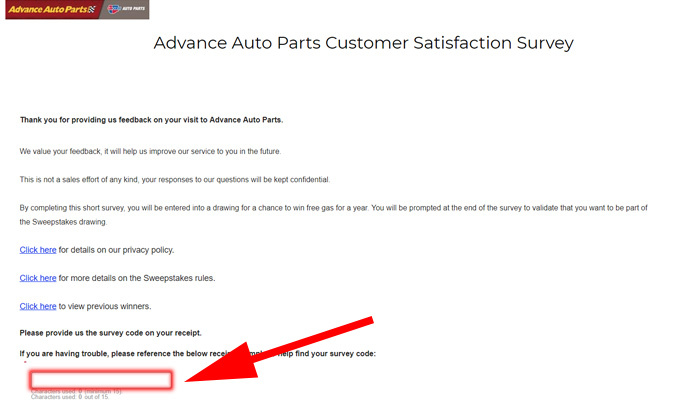 Advance Auto Parts is looking for the opinions of their customers on their advanceautoparts.com survey. If you need help with the survey process, this guide will provide you with the exact steps you’ll need to take. We also explain the sweepstakes rules, tell you what prizes you can win, and offer Advance Auto Parts contact information. The prize that Advance Auto Parts is giving away as a reward is the chance to win $2,500 in gift cards that you can redeem at select gas retailers, or, as they advertise it, free gas for a whole year. Completing the survey will give you one entry in the Advance Auto Parts sweepstakes. The company is giving away this prize on a quarterly basis. This means that you’ll have four chances to win throughout the year if you take part in the survey process each quarter. If you do win, you have to keep in mind that the prize is non-transferable, and that you cannot substitute it or redeem it for cash. If you want to learn more about the full process of redeeming your prize, check out their official rules. At the time of survey completion, you must be at least 18 years old. The sweepstakes is limited to residents of the US, Puerto Rico, and the District of Columbia. Advance Auto Parts employees and family or household members of employees are not eligible for the sweepstakes. You only get one entry per sweepstakes period. Check your receipt to see if you’ve been chosen to take the survey. It will usually offer you a chance to win free gas for a year. Visit the advanceautoparts.com survey page. Look at your Advance Auto Parts receipt and find where it says “Enter this code.” This is the code you’ll need to enter on the website. Enter the code in the provided field. Click the Next button to start the survey. Answer the questions that Advance Auto Parts presents to you. During or after the survey, you’ll be prompted to enter your personal information. Make sure this information is correct so that you are contacted if you win. Most people have no issues with the survey, but here are some problems that may possibly arise, as well as their respective solutions. 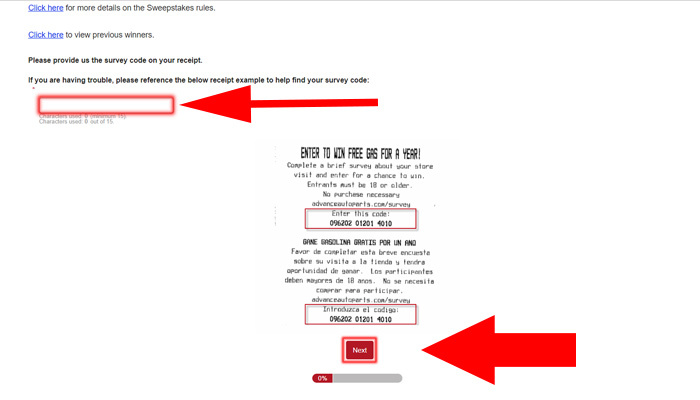 The survey will not start if the code on your receipt is not correct. Check to see that you didn’t put in the wrong numbers. You can view a list of past winners if you’re curious. Advance Auto Parts Mailing Address: Advance Auto Parts, Inc.